Amazon today unveiled its latest “Fire” branded product, called the “Fire TV Cube.” The company describes the device as a hands-free box that streams 4K Ultra HD video using Alexa voice controls. The set-top box appears to have many features similar (or coming soon) to the Apple TV 4K, with 4K HDR content, smart assistant integration, HDMI CEC, Dolby Atmos support, and more. With far-field voice recognition, one difference between the two devices is that the Fire TV Cube relies on eight microphones embedded into the box to hear users across the room, whereas Apple TV 4K picks up commands solely via the handheld Siri Remote. The Fire TV Cube does ship with an Alexa Voice Remote, however, so handheld commands are also an option. Another notable difference is the Fire TV Cube’s compatibility with set-top boxes from cable companies including Comcast, DISH, and DirecTV. 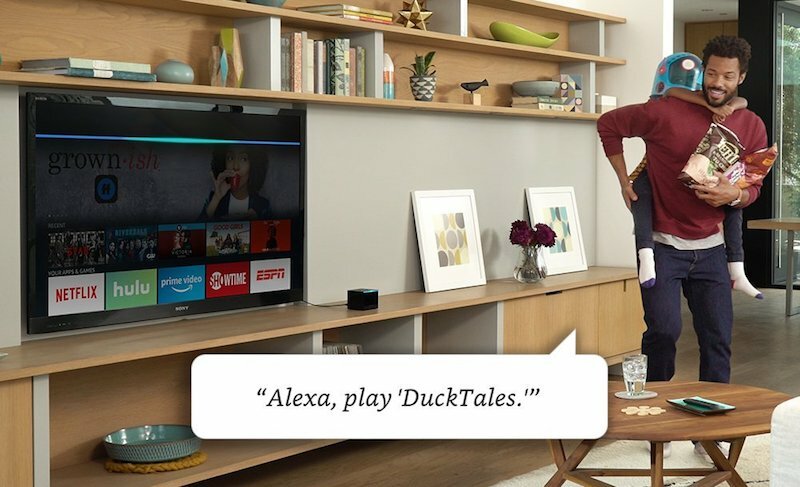 With the integration, users can ask Alexa to “switch to channel 31” and the Fire TV Cube will speak to the cable box to initiate the command. Otherwise, the Fire TV Cube has a user interface that Amazon says puts “content forward” and is built around voice control. Commands include “Alexa, find sci-fi movies”; “Alexa, play the trailer”; and “Alexa, show me more results.” Users can also initiate searches based on directors and actors. Additionally, the company optimized Alexa responses for the big screen “with rich visual information,” so users can view smart home camera feeds, check out the news, catch up with sports, look at the weather, and more after asking Alexa for each task. The Fire TV Cube can be pre-ordered today and tomorrow for a special price of $89.99 (for Prime members only), and afterwards the device will cost $119.99. The Cube comes with 16GB of storage, a power adapter, IR extender cable, Ethernet adapter, Alexa Voice Remote, and will begin shipping out to customers on June 21. Anyone who buys the device and registers it by July 1 will get a $10 credit for Prime Video.